Do you love oatmeal? Do you love pancakes? 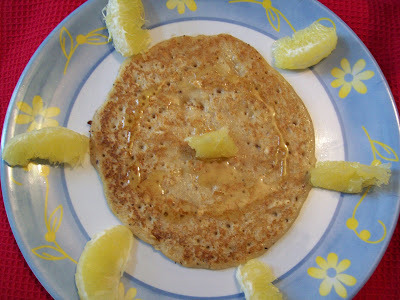 You should try them when they are one and the same A healthy version of the traditional pancakes which are made of wheat flour This is a great basic high-fiber, but very light .The pancake recipe below is delicious. You'll also find it is actually cheaper to make because it can be made from ingredients you've already got in your cupboards. The oats in this recipe provide an extended source of energy and a special taste that comes only with the small effort of cooking from scratch.Honey and orange gives special taste to this pancake. 1.Combine all the ingredients except the fruit salt in a bowl with enough water. 2 Whisk till it is a smooth batter. 3. Heat a non-stick pan and grease it with a little low fat butter. 4. Add the fruit salt to the batter and mix well. Divide into 6 equal portions. 5. 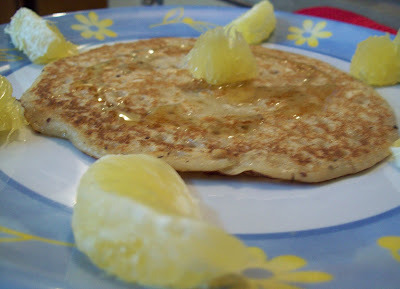 Pour a spoonful of the batter on the pan to make pancake, cooking on both sides with a little butter till golden brown. 6.Repeat with the remaining batter to makemore pancakes. 7. Serve hot with honey and oranges. (Really the Taste is divine). thanx for this lovely recipe I will sure make this! Thanks for dropping by.You have a yummy blog.Good job. It's a great idea. Thank you. Wow this is called comforting food. Looks gr8 and sounds healthy. Good healthy pancakes.....I like anything that is high fiber and low carb. Hi Friends Thank you all for lovely comments.Happy Diwali to you all.